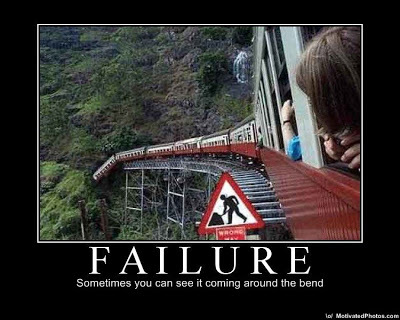 Your doctor is being set up to fail – the evidence so far …! It is time to end the blame game, defend doctors and provide an actual solution for restructuring the MBS, following the comments from Federal Health Minister Sussan Ley in the wake of the recent 4 Corners report see http://www.abc.net.au/4corners/stories/2015/09/28/4318883.htm and http://www.healthandlife.com.au/wp-content/uploads/2015/09/TV-show-points-finger-at-GPs-for-much-of-Medicare-waste.pdf. These statements were comments on the alleged rampant misuse of outdated Medicare Benefits Schedule (MBS) items. The 4 Corners report alleges $46 billion is wasted on possibly inappropriate treatment provided to patients. While we agree that much needed reforms and updates to the Medicare schedule are long overdue, we question if this report unfairly blamed doctors for what is a combination of historical systemic failures, limitations within the MBS system structure and potential over servicing. There are three clear reasons for this finding, detailed below. We prefer to view your health care like a car journey. As new suburbs keep getting built, new roads are made. There are no set train station stops or controlled rail line ends. Your health care can rapidly evolve during any journey. Your GP should act like a GPS in your car. They should be there at all times to guide you. Ultimately, you as the patient are responsible for making the final decision and taking ownership of your own health. Nobody can do this but you and/or your carers (passengers). For frustrated Doctors and Practice Managers, the evidence we provide below throws into question the allegation that doctors are primarily responsible for the rampant misuse reported. Our point is there are no commonly agreed and/or published road rules amongst the profession or the Government. We believe that planning the real journey starts here. No one will take responsibility for interpreting the MBS! 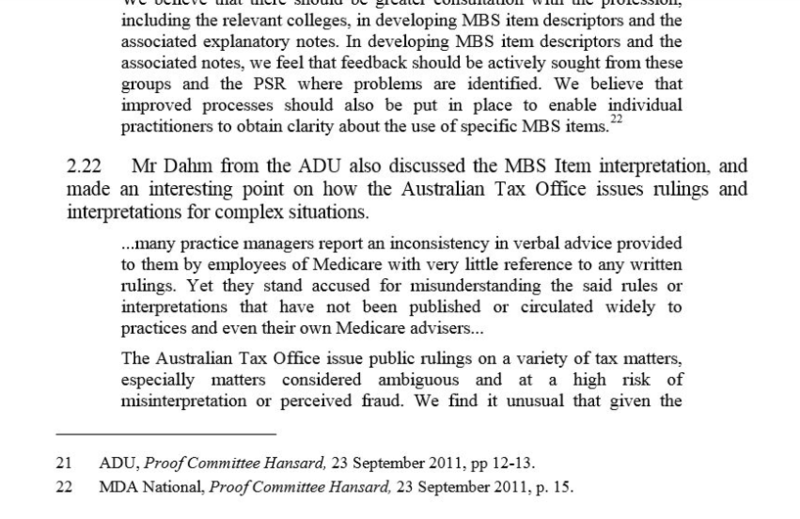 A 2011 Senate inquiry into the MBS has already clearly demonstrated the catch-22 faced by GPs when attempting to correctly interpret schedule items. The inquiry, to which we gave evidence1, led to the Government and Medicare conceding that they were legally not able to provide binding advice to GPs regarding the appropriate use of specific items in individual cases. Peak bodies such as Medicare, RACGP and AMA are also unable to provide legally binding advice due to judgements around interpretation ultimately resting with the Professional Services Review (PSR). How do you prosecute or remove funding for services where there are no road rules that you or doctors can access or follow? However, the idea of a peer reviewed and published “public tax ruling” idea 2 has not yet been enacted. This may be due to our final point 4, that the Government cannot interfere in the doctor patient relationship. Therefore, they only have the capacity to publish “administrative rulings” and not clinical ones. 3. The Government/Medicare does not have legal authority to interfere in the doctor patient relationship. Yet another important point is that evidence is not absolute or finite, it continues to evolve. We agree that at some stage, we do need to draw the line on treatments that are not effective as supported by empirical evidence. We need a Medicare Benefits System that allows for this, while giving doctors freedom to exercise their clinical judgement. Most importantly, we should not punish doctors for getting it wrong where there may be a systemic doubt that the instructions (if any) they receive were right in the first place. To solve this problem, we need to start at the top. The solution needs absolute political will and vision. Peer-elect Presidents of professional bodies, such as the surgical colleges (and not individual experts or reports) need an urgent meeting of minds to get the structure and the system right. These Presidents should sign off on behalf of their members, rather than as individual experts, the most appropriate, open and transparent clinical guidelines that the Government/Medicare can use to aid in the restructuring process of the MBS. While this will take time and resources, it is not until all the key professional bodies as representatives of individual practitioners have responsibility for this process that it will be broadly accepted as a system that works for all. Adjunct to the above point, more self-regulation by the medical professional bodies endorsed by your members that represent the Specialities of medicine is required. This solution is a matter of public record2. To do nothing and expect the same will leave no alternative but an unprecedented, unilateral MBS austerity program. We predict that such a program will only breed more unnecessary fear and uncertainty for patients and providers. Meanwhile, your patients or loved ones will continue to be victims of an unchecked system, where doctors are essentially being set up to fail. How can you expect your local GP be expected to keep up to date when the Government is not able to? We are happy to stand corrected on any points made in this article and welcome any feedback. 1Nationally, over the last 24 years we have been observing Medicare audit activity. We were concerned about bullying and intimidation tactics used by Medicare against doctors, especially in relation to Pap Smear Clinics. We were involved in establishing a successful national Senate enquiry in 2011 on Medicare Audits and inappropriate prosecutions. This work was pro bono and did not involve any Health and Life clients. The call for an inquiry was led by pre-eminent specialists and Professors. Previous postCould you be responsible for the death of your Practice? Four key areas to watch! This is a well considered response David. Thank-you.